The topic of insurance coverage has come up a bit in the Facebook groups recently. There were some good questions. Having been through a few (ha!) surgeries, appealing rejected claims, and recently switching from one provider to another (United Healthcare > Blue Cross Blue Shield), I have a little bit of experience dealing with insurance and can share some thoughts and things to consider. Please note: I’m in the US and have coverage through my employer. Different insurance carriers and their plan benefits will vary, so call your provider with any specific questions you may have for your own scenario. Also, I am sharing my understanding based on personal experience; my costs outlined here. If you have additional tips, feedback, or corrections, please send them to me. Would love to get some information about Tricare too. These amounts will tell you how much of the costs you will be responsible for. The deductible is how much you must pay up front before your insurance kicks in (ex: $1,000 for me); cost-share is the portion your insurance (or you, depending on how it’s written) will pay after deductible is met (ex: 80% covered by insurance/20% for me to pay) up to the OOM; the OOM is the maximum that you will have to pay out of your own pocket for the plan year ($3,500 for me). All of these amounts are in your plan documentation. Also, your plan will have different amounts for out-of-network providers, as well as individual vs. family amounts. This is an important one. Typically the doctor’s office will handle this on your behalf, but may not. If you are responsible, do this for every single provider (and facility) that will be participating in your procedure. If your doc’s billing department is handling it, make sure you confirm with them. It is not unheard of for insurance providers to reject a claim because proper pre-authorization wasn’t granted .. even if it is a qualifying procedure and the provider is in-network. If rejected, appeal (see #4). Another one that can get you. Don’t assume that because your plastic surgeon is in-network, that the anesthesiologist will be too. Different providers and facilities will bill separately and they may not all have a contract with your provider. For each of my surgeries I got a bill from plastic surgeon (+ onco surgeon for PBM), anesthesiologist, pathology lab, and hospital. If your insurance provider rejects a pre-auth request or claim, find out why. There are many possible answers: they deem a procedure medically unnecessary or experimental, procedure coding issue, no required pre-authorization, a provider or facility is out-of-network, etc. See if your doc’s billing department will help resolve. If not or unsuccessful, appeal. Call and find out what the appeal process entails. If it’s a medical necessity issue, ask your doc to write a letter. If it’s an out-of-network problem, explain why you used that doctor vs. another one in-network. You may have to attend a hearing or submit documentation. Deductible and OOM typically reset when your plan year does and this doesn’t always coincide with the calendar year. This is important when you expect to have multiple procedures. 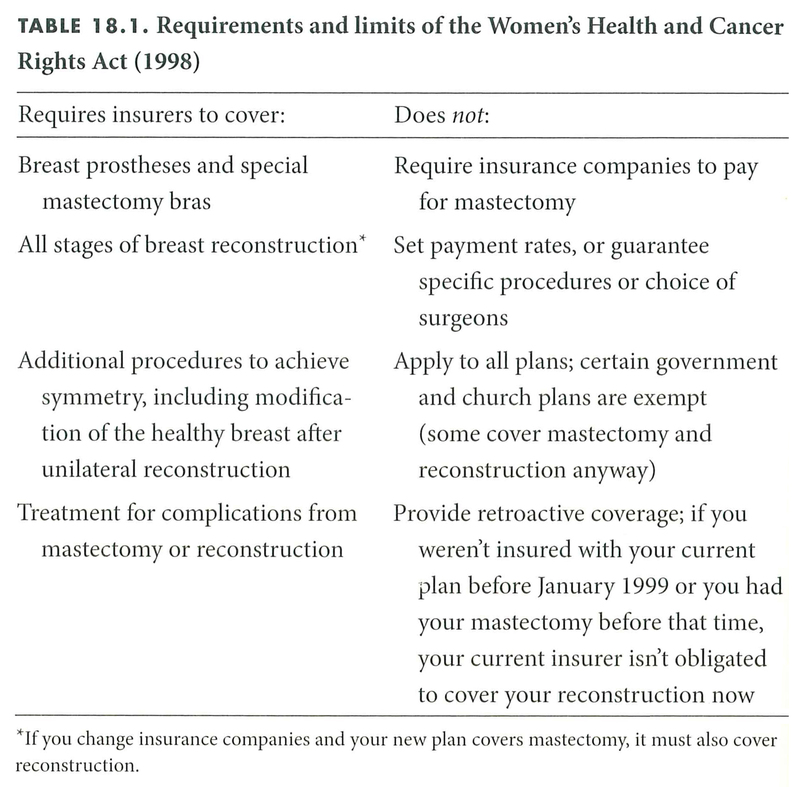 Ex: if you’re having mastectomy and reconstruction with expanders and then implants, you will have two surgeries. Say your plan year starts in August and you have the mastectomy in April followed by exchange in October, you will have to pay OOM twice. I am now on my third plan year, unfortunately, so 3 x $3,500. There’s also the Family Medical Leave Act, which applies to work protection and is not related to insurance coverage, but worth mentioning. FMLA entitles employees to take unpaid leave for family or medical reasons of up to 12 work weeks in a 12 month period and still have a job to come back to. There are some caveats to this one too. Read more about it on the Department of Labor site. Don’t forget Short Term Disability if you have that coverage. This will cover a portion of your wages, while you are out. Whew, that was a lot. Did I forget anything? This entry was posted in All and tagged breast cancer, coverage, deductible, disability, fmla, health, insurance, Mastectomy, pre-authorization, Reconstruction, reject, whcra on February 25, 2015 by nope2BC.